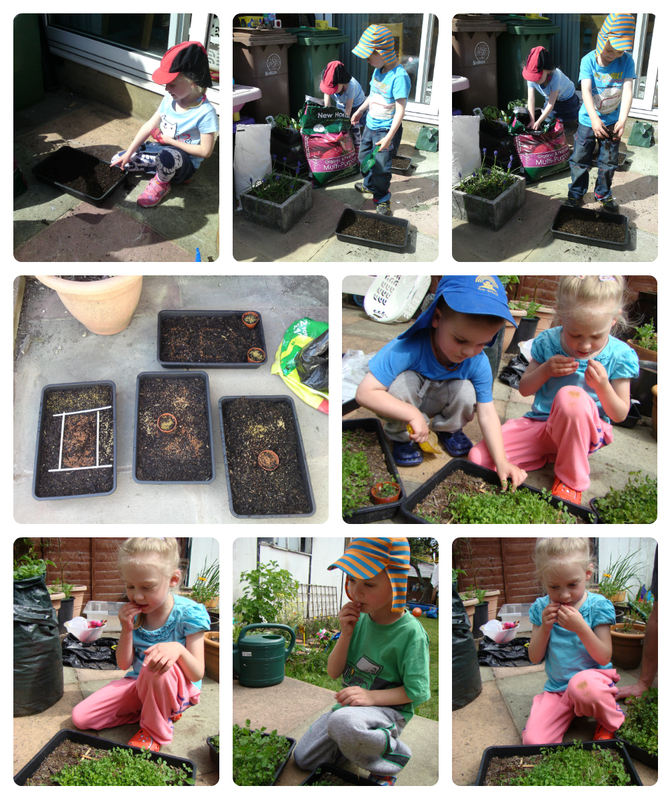 A few weeks ago I had an idea for the kids to grow their own edible seed tray garden. I bought 5 different types of quick growing seeds and thought we could use stones, shells, twigs and some of our toys to create the gardens. Recent circumstances have meant we didn’t really do what I initially intended, but the seeds grew well and yesterday we finally got round to eating some of our “grass”; that being all we did with the gardens in the end! We planted, grew and ate micro-brocolli and micro-rocket, alfalfa, cress and mustard. The boys tried a little bit of everything but I can’t say they were big fans of their greens. Jasmine, on the other hand, loved it all and spent most of the afternoon picking bits from her garden to eat! 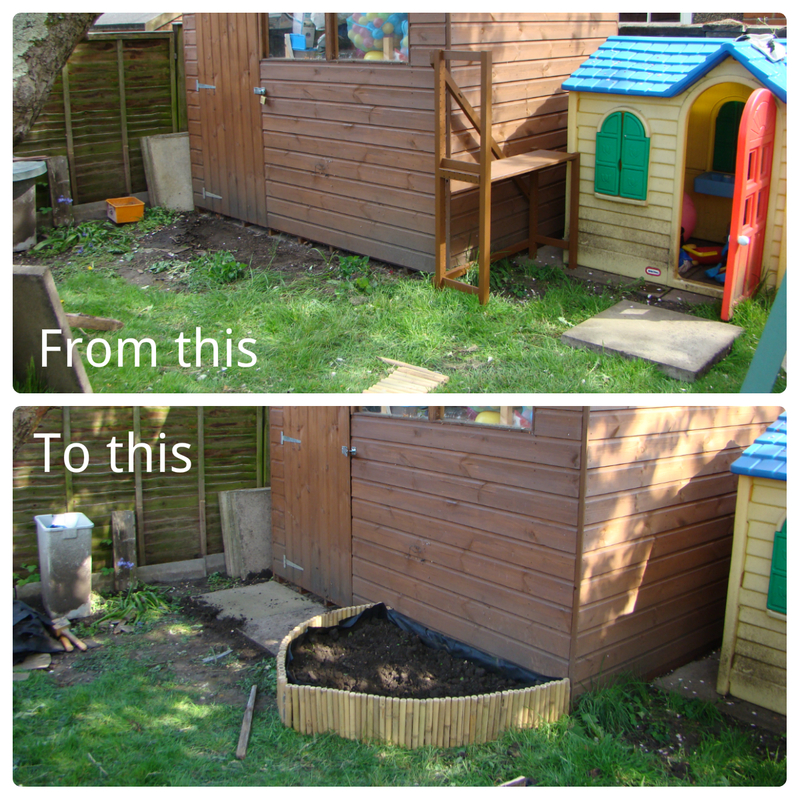 As well as enjoying our home grown greens yesterday, we finally dug out the kids mud area. This is eventually going to have their Mud Kitchen next to it (when i finally finish weather-proofing it that is) The kids can’t wait to get into the garden again and play in their very own bit of mud! I have made sure there are a lot of worms in there for them to find! Funny that we have both been planting this week and playing in mud. The seed gardens sound like a great idea and a good way to get kids to try greens too. I can see some great Country Kids posts coming from that mud garden as the summer goes on. Thank you for sharing on Country Kids. I wish we’d done more with the seed gardens to be honest but I guess that gives me the perfect excuse to do them again! I’m quite lucky as Jasmine loves anything green and will try anything she can pick herself! Ben will try anything but doesn’t always like what he tries. Thomas is getting better but we need to work on the “green leaf” issue 😉 He’s more of a root fan (carrot is his favourite). And yes, I think the mud garden will feature a lot going forwards! Their own mud! How cool is that! A great idea to grow it and eat it!